Fluidity was released on December 6, 2010 in North America through Nintendo's WiiWare service. Fluidity was developed by Curve Studios and published by Nintendo. The game is available for download through the WiiWare service for 1200 Wii Points, which is $12. A portion of the game's description reads, "Tilt or twist your Wii Remote controller to use the various forms and properties of water on your free-flowing journey through Aquaticus, where every page has multiple panels and illustrations that have come to life. ...additional powers, such as sticking to objects as a block of ice or shooting bolts of lightning as a steam cloud, will be needed to win the day and destroy the Influence and its minions." The ESRB rating for Fluidity is "E for Everyone", with "Comic Mischief" being the only content listed for parents to be aware of. How many hours have Wii owners spent sloshing and sliding their way through Fluidity, in the 64 days reported? Let's take a look! 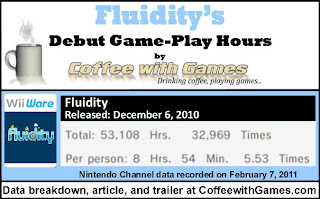 Fluidity has 5,961 Wii owners reporting game-play data through the Wii's Nintendo Channel for its debut, just 64 days after it released. Fluidity has 53,108 Total Hours of game-play reported on its debut, with an average "sloshing" play-time of 8 Hours 54 Minutes "Per person" reporting data. Fluidity's average play-time per session is just over 1 Hour 36 Minutes. Fluidity is currently in the top 20 on the WiiWare's "Popular Titles" section, sitting at the #11 spot. Based on the approximate number of players reporting data, and the $12 price point of Fluidity, Curve Studios' net sales on Fluidity would be about $71,532 in the United States, before profit sharing with Nintendo. Fluidity has been received well by the "professional" reviewers, and its current "professional" review score average is 86.78%, based on 9 reviews on GameRankings.com. I thought it was interesting that Fluidity allows you to take on the different states of water: solid(ice), liquid(water) and gas(steam). With H2O in each of those states, you could use the water to brew regular coffee, use the ice to make iced coffee, or use the steam to make an espresso drink...how fitting! Second, if you think you might be interested in the game, but aren't sure; I highly suggest going to the Wii's Shop Channel and downloading the free demo for Fluidity and giving it a try. I just completed the demo, and found it to be rather fun and interesting. If you like puzzle-platform type games, I really suggest you give it a try! Considering that Fluidity is a brand new IP, and a WiiWare title, I think the fact that it debuted in just 64 days is really awesome for the game. With the game's price tag being $12 compared to a lot of other WiiWare titles with lower price points, I think it's a good sign for Curve Studios and Nintendo that the game is still in the top 20 right now. The one bit of game-play data that I'm really surprised by is the average hours "Per person" being 8 Hours 54 Minutes...especially for a $12 game! There are many full retail games that release at $50 or more, that have about the same number of hours for a single-player campaign. Being that I haven't played the full WiiWare version of Fluidity, I don't know how many hours it takes to complete just the main campaign, but I do know there are items players can go back to find in levels to unlock another mode in the game; so the 8 Hours 54 Minutes could be reflecting more of the "completionist" players that are going back to collect everything. If you have played and beaten Fluidity, about how many hours did it take you to complete? From your experience with Fluidity is it a WiiWare game you would recommend to other Wii owners looking for a good puzzle-platforming type game? I've actually enjoyed the demo quite a lot, but apart from me being a bit turned off from buying Wiiware I've still got way too many games to play and finish. If anything I should play more Super Meat Boy again. Still, I'd recommend anyone to try this demo as it's a really nice looking and feeling game and I'm sure it only gets better after the demo ended. Although I heard the spike in difficulty in the last levels is awfully demotivating. "...but apart from me being a bit turned off from buying Wiiware..."
Why are you turned off from buying WiiWare? I really liked the demo, but I have about 5 wiiware games to finish still. Lost Winds 2, Cave Story, Master Blaster, Rage the Gladiator, And Yet it moves. Plus the 12 dollars price tag gave me pause as well. 8-10 bucks seems better to me. Maybe they would sell more copies if they fixed there freakin shop channel. Only have the demo, at this point. It's something I knew would go on my "To Buy" list when they first showed it off. I have heard that it has a lot to do, though there are some complaints about how some levels ask you to travel back through portions of previous levels to get to the new parts and the goal of those other levels. Man, these demos have completely filled my SD card, so me being OCD, I've got to spend some buck on a bigger SD card instead of a WiiWare game or two (or three). Rage of the Gladiator is calling your name I think! How far did you make it in Rage of the Gladiator? I haven't played your other WiiWare games, other than the And Yet It Moves demo...which I thought was interesting, but as you probably know, I really enjoyed Rage of the Gladiator. You can find 4GB SD cards for under $10 on Amazon...I use a 4GB, and have a good amount of room left for demos and actual games still. As for Fluidity, I did read about the back-tracking in some levels, but it seems that it's a minor issue, and most of the people enjoy the game...especially with an average play-time of almost 9 hours. Thank you both for the comments and feedback! I forgot to check and reply here it seems. Turned off from Wiiware with the whole buying points and not having an account but bound to the console thing. Even more now that the bit.trip games end up being ported to Steam. Same for Nyxquest and such. Apart from beat I'd get any bit.trip game on the PC, for better visuals and sound quality and since only the controls for beat and soon flux with the Wiimote are what I can get only on Wii without some trickery. I'm spoiled from Steam and a nice account system, updates, great sales and ease of use, friendlists and infos and easy pairing up with multiplayer games and all that. Let alone I buy a game and that's that. No dumb points to pre-buy and then spend half of them or another awkward amount on a game, leaving me with too few to buy anything else without adding yet another amount of points. So if fluidity was on Steam for example, I'd just have it on my wishlist and might simply pick it up if they have it in a crazy sale for 50% or less, even if I don't immediately play it or "want it that bad". On the Wii there's a lot more steps and if I don't want a game specifically and really bad and it offers something Wii-centric, I'm just not likely to get it anymore now. I played the demo a few weeks ago and had a great time with it. And puns aside it was 'refreshing' to do something different with the mote which didn't seem like a gimmick at the time. It also seemed like a quality title and not just some casual wiiware slop. It's certainly on my 'to be considered later' list, but not crucial at this time. As gLitterBug mentioned the shopping experience is just poor and does make it more cumbersome to purchase than it should be. (perhaps we're just spoiled by Steam?) I honestly never see sales on WiiWare titles which is also part of my decision process. But that's not to say that WiiWare titles don't have merit on their own. I own World Of Goo on PC and Wii and it's difficult to compete [fun factor] with 4-player party mode on the wii. "Turned off from Wiiware with the whole buying points and not having an account but bound to the console thing." I think Nintendo is trying to fix this with the 3DS, by getting rid of the "Wii/DSi Points" system, and using a straight dollar/money ratio. Also, it's interesting you mentioned Steam, as it's a service I don't use...just because I really don't game on my PC anymore, but I've heard a lot of great things about the service. "And puns aside it was 'refreshing' to do something different with the mote which didn't seem like a gimmick at the time." Haha! The developers could probably use that in marketing the game more! "I honestly never see sales on WiiWare titles which is also part of my decision process." I do think this is an issue Nintendo should address somehow. If WiiWare developers release a game, and aren't getting good sales on it, I would think dropping the price in some instances would help the game sell more, but Nintendo doesn't allow price drops on the WiiWare service. So, even if a game is out for 1-2 years on the WiiWare service, it won't see a price drop because of Nintendo's policy. Thank you both for the comments/feedback! I appreciate it! A gamer that's not on steam? I didn't think such things existed. There is something to be said for a console experience, but still hard to beat steam. Great stuff for travel and a quick few minutes at lunch too. That's interesting about N's policy of not lowering prices on WiiWare or VC titles. I had no idea.